Joseph Kosuth is generally considered to be the father of analytical Conceptualism. Along with many artists of the sixties, he was influenced by the ‘anti-art’ ideas of Marcel Duchamp which contested the notion that traditional art-objects such as paintings or sculptures were necessary elements in the creation of art. 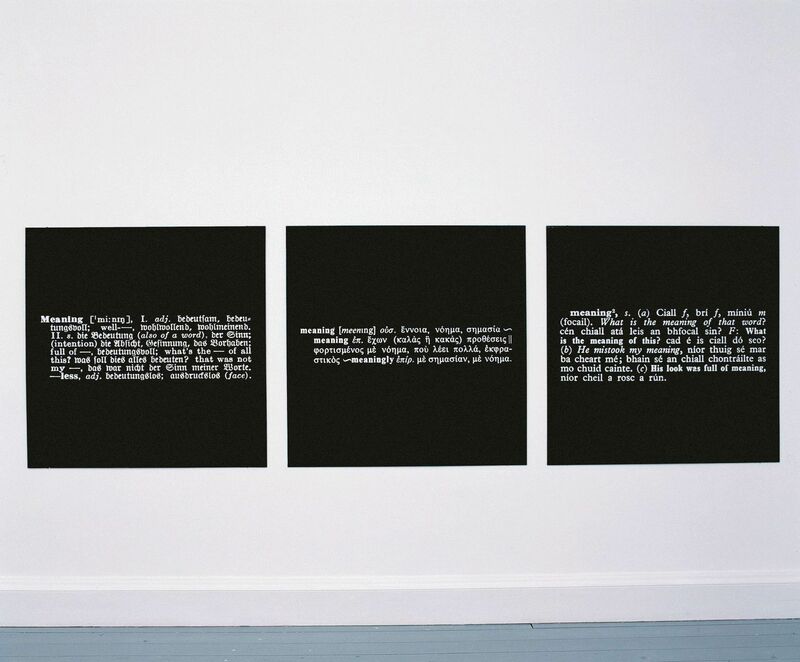 Kosuth’s work, rooted in Freud, Wittgenstein and French philosophical theory, investigates the linguistic nature of art propositions and their social, institutional, psychological and ethnological contexts. His writings, especially ‘Art after Philosophy and After: Collected Writings’, 1966-1990 consolidated his position as one of the pioneers of an extended definition for art and an expanded role and responsibility for the artist. In that text he says: ” In this period of man, after philosophy and religion, art may possibly be one endeavour that fulfils what another age might have called man’s spiritual needs”*. This work formed part of a major exhibition at the Irish Museum of Modern Art entitled ‘Guests and Foreigners, Rules and Meanings’ in 1997. *Joseph Kosuth, ‘Art after Philosophy and After: Collected Writings, 1966-1990’, Edited by Gabriele Guercio, MIT Press, 1991.